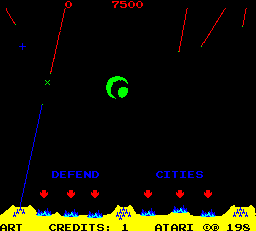 Missile command was originally to be titled Armageddon, with realistic graphics depicting real geographical locations. A change of heart, due to the general dislike of war imagery at what was the height of the nuclear deterrent age saw the retitling and simplifying of the graphics. 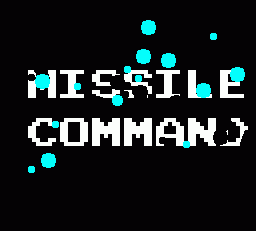 So while Missile command looks simple, it's certainly hectic in gameplay. Controlling a crosshair targetting mechanism by way of a responsive trackball (on the arcade machine) or mouse (preferable in MAME as the keyboard is a nightmare! 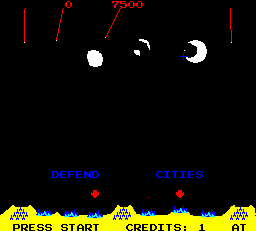 ), the aim of the game is to protect the six cities located at the bottom of the screen. The main adversary to face is the enemy tracer missiles. These track down the screen and can only be destroyed by bombs contacting the actual missile point as it makes its way down the screen. There are also bonus objects to be destroyed which move across the screen, usually in the form of an alien spaceship or an aeroplane. There are three firing positions located among the six cities at the bottom of the screen, and you are limited to a certain amount of ammunition stored in each. You have to make tactical decisions about which enemy shots to take out from which position, and things get more hectic when you are down to two bullets reamaining in your left hand bunker only, and there are shots raining down on the right! Your shots are fired to the point where your crosshair is located at the time you launch, and the missile impacts there and sends out a visible shockwave. Any enemies within the shockwave are destroyed. On later levels you face enemy bombs which are without trails and try to avoid your shots. A scoring multiplier based on the wave being played is displayed at the start of each level. Points are awarded for destroying enemy missiles, ships and planes. Bonus points are awarded at the end of each stage for any cities and missiles remaining. A sound tactic used by many is to fire a sweeping barrage of missiles across the top of the screen at the start of a wave thereby taking out many of the first shots fired by the enemy. There are usually two main attack waves per stage. Just when it looks like things have calmed down, another assault commences. Repeating the strategy above is a good idea. The enemy bombs which avoid your missiles are usually fooled by a couple of quick missiles being fired on opposite sides of the bomb, but overlapping. The bomb cannot then escape.